at the State Theatre tomorrow. of Swingland, alias Dorothy Lamour. tainted revision of "Sailor Beware,"
who sees this bit of vernal madness. tics in his famous "The Circus." old Majestic, 25c til 5 p.m. an 40c. Under the management of L. X.
way of motion picture entertainment. State will act in the public, interest. ous "The Girl of the Golden West,"
regular daily vaudeville shows began. 1928 the year the Michigan opened. use of showing motion pictures. exclusively a motion picture theatr e.
ment went into action immediately. modernity is the key note. Mr.'L. E.
the war situation, it was impossible. the time, with a constant draft. 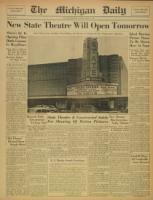 isn't the new State Theatre. three large circles of indirect lights. by rich brown Brazilian mahogany. by rectangles of. dubonnet and green. ambition to make it and maintamn it as something more than a.
have left the stage of local theatres. nomnn,'rnca n, , t a a,., rnt.